Allocating budget strategically is the best way to manage limited financial resources. We’ll assume you have a ministry action plan by now, so use it or something like it to prioritize how and where you spend money. Leader – List the leader responsible for submitting and executing the action plans detailed in this budget line. Budget Line # – Provide the church budget line number. Description – Describe the general budget purpose of this budget line. Strategic Area – List the broad strategic area fed by this budget line—E.g. Evangelism, Discipleship, Ministry, Missions or Worship. 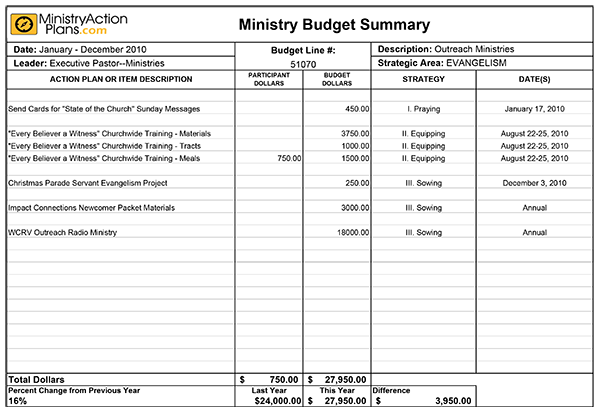 Action Plan or Item Description – List all tactics and items for this budget line. Participant Dollars – List the total dollars paid in participant fees per item. Budget Dollars – List the total dollars requested from the budget per item. Strategy – List the strategy fulfilled by each tactic. Date(s) – List the calendar dates for each action plan. Note that many areas of a church budget are administrative and intended as a general support for all the ministries of the church. These can include salaries and benefits, professional expenses, office support, maintenance, utilities, insurance, security, building support, debt service and other items. These budget lines will be labeled “General” under the strategic area heading and will not have a specific strategy attached to their action plan or item description. 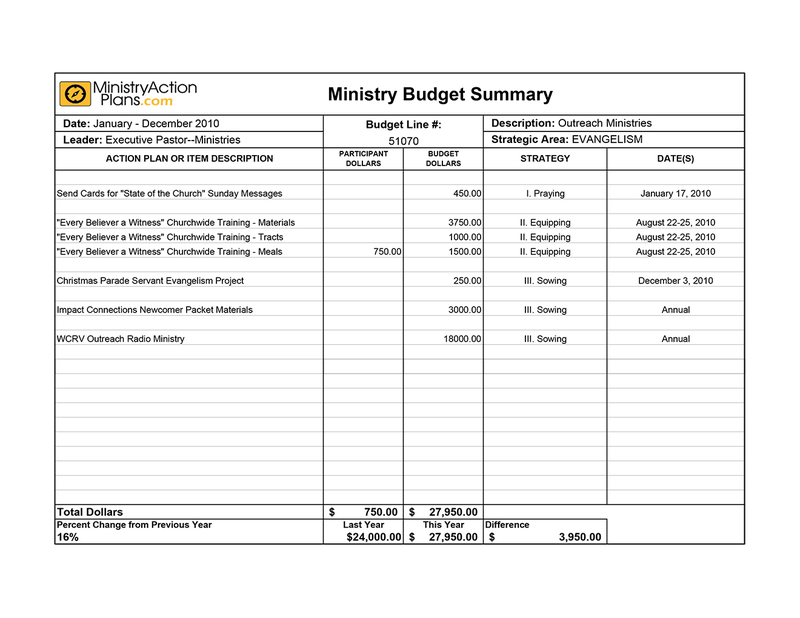 When you begin preparations for your next church budget, use the Strategy Planning Budget Summary Worksheet to link spending to strategic priorities. Consider formatting the church budget so that clearly-defined strategies drive the allocation of budget funds.